Background: Homeostasis of blood glucose concentration is a physiological phenomenon that is tightly regulated in humans and acts as a major cellular mechanism that decreases blood glucose during insulin-stimulated glucose transport. GLUT4 assumes a significant role in managing entire body glucose homeostasis. Recent research has found that overexpression of GLUT4 reduces glucose intolerance and diabetes. Interestingly, reduction of GLUT4 by inhibiting glucose transport has been found to have a powerful chemotherapeutic impact on myeloma. In order to further examine such interactions, a high-resolution crystal structure would be particularly useful. A homology model was produced for GLUT4 to screen for drug-like compounds and other docking complex connections. Conclusion: Our study provides further data for determining the role of GLUT controllers used to target glucose transport. 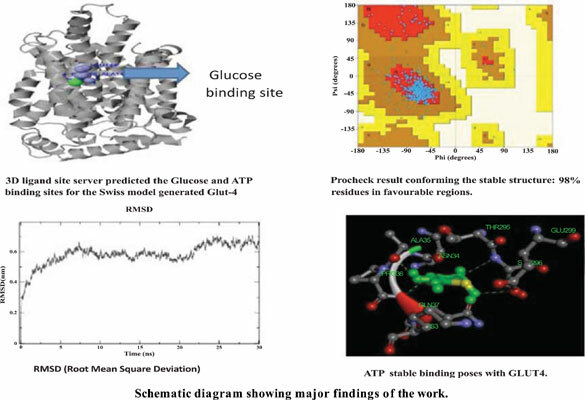 Clarification of the three-dimensional structure of these transporters utilizing the steady, powerful and highly precise SWISS-MODEL protein structure prediction server will fundamentally help in the advancement of novel medications. The predicted model protein, GLUT4, demonstrated a comparable affinity for ATP and with inhibitor metformin binding motifs. GLUT4, SWISS-MODEL, docking, ATP, metformin, homeostasis.